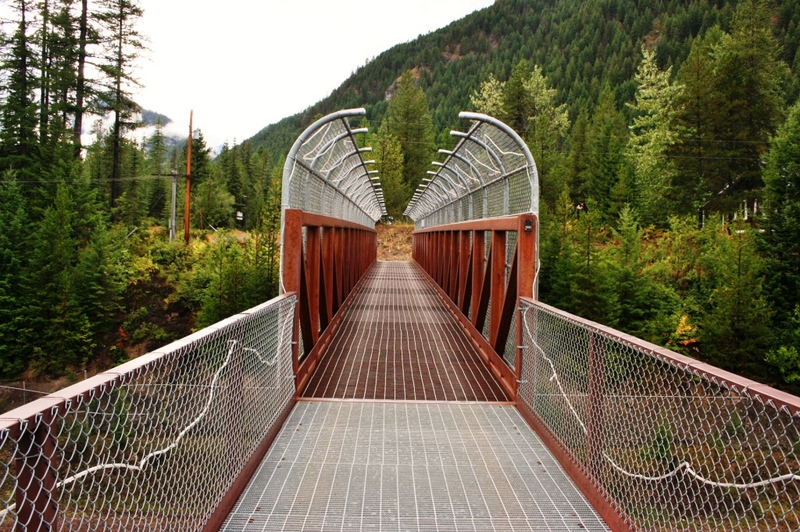 Finding yourself in northern Montana is usually no mistake, something took you off the beaten path to explore this part of the Northern Rocky Mountains. For most; it’s a visit to Glacier National Park. 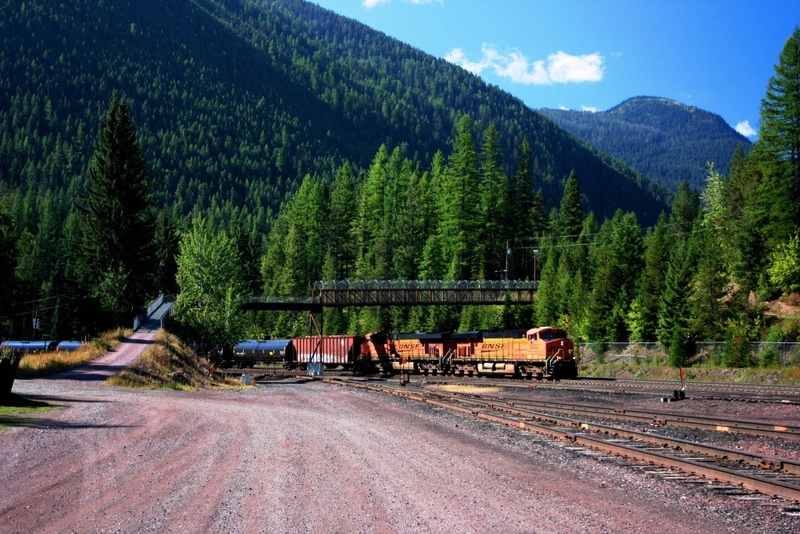 For train buffs it maybe to explore and view trains on BNSF Railway’s Marias Pass. 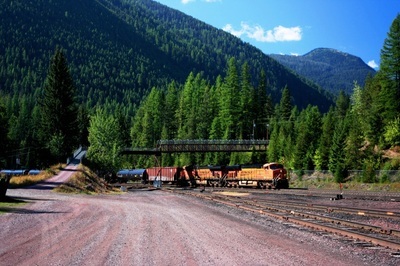 Marias Pass was charted by the Great Northern Railway in 1889, today the high mountain pass near Glacier National Park is traversed by both the BNSF Railway and the only main highway in the area, US-2. 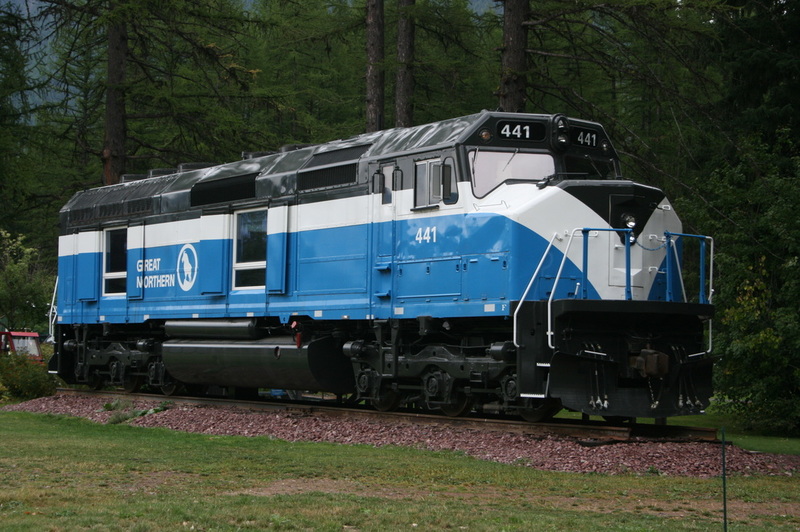 Glacier National Park itself had its origin ties to the Great Northern Railway, and to this day there is no lack of the well known Great Northern Railway logo (mountain goat on top of a mountain) throughout the area and the park itself, from door handles and statues to postcards, it’s not hard to figure out that you’re in Great Northern Railway country! 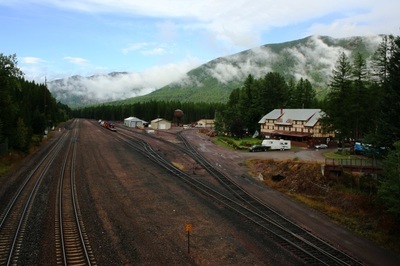 Centered in the area and located along the southern border of Glacier National Park is the small town of Essex. 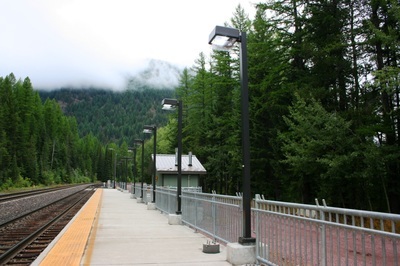 I use the word “town” very loosely; Essex is pretty much made up of the Izaak Walton Inn, an Amtrak stop (platform), a small BNSF yard mainly used by helper locomotives and work/snow equipment, and a handful of both seasonal & unseasonal dwellings. The Izaak Walton Inn is the towns highlight. Any train buff visiting the area should not miss spending at least a couple nights at the Inn. The railroad line is referred to as the Northern Transcon by BNSF, it’s the mainline between Chicago and the north west. There are a good 24 trains a day through Essex. Intermodal, oil, grain, and merchandise freights plus two daily Amtrak trains keep the mainline busy. Railfanning Essex and the surrounding area are very easy with numerous public areas to enjoy scenic and legal locations for photography. The folks at Izaak Walton Inn make it extremely easy to visit the area via Amtrak. Although the Amtrak platform is a short walk down the road, the Inn has a van that they use to shuttle guests and their luggage to/from the Amtrak station. 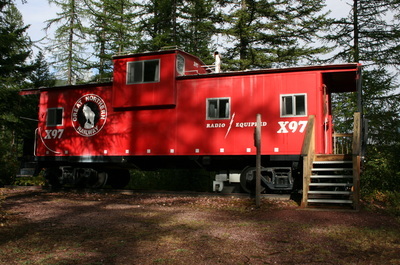 The Izaak Walton Inn is a stop for the Red Bus Tours (Glacier Park Transportation, Inc). 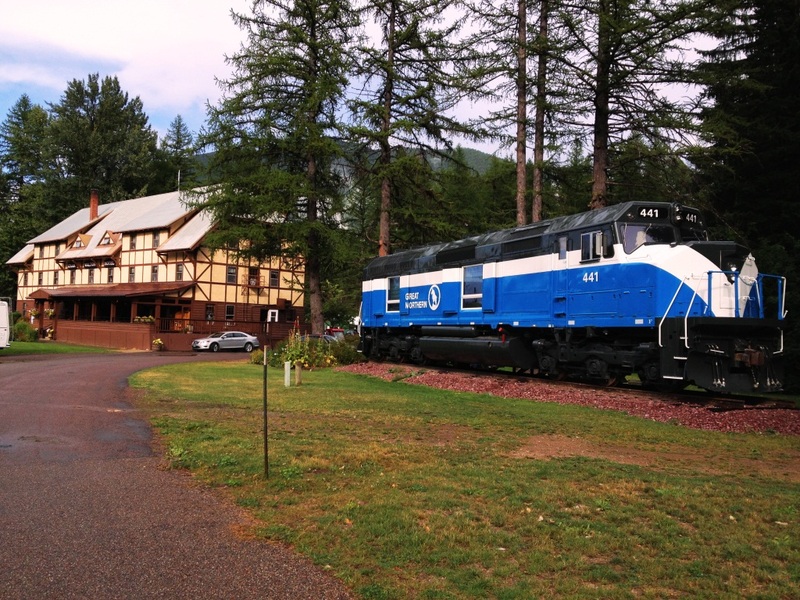 A more personal option for local transportation is to rent a car from Izaak Walton Inn. The rental cars come with limited mileage which mathematically pretty much covers a pass through Glacier National Park and return before the extra mileage charge kicks in. Visitors who spend a day in Essex can take a hike on the many trails or spend the day train-watching from the Inn or surrounding property. For those media freaks, and electronic goo rues, Essex doesn’t have any cell phone reception. The Izaak Walton Inn doesn’t have TV’s or in room telephones. The downstairs basement/bar/lounge offers free wi-fi for guests & visitors. Railroad(s): BNSF Railway / Amtrak (trains # 7 + # 8 daily). Rail Traffic: Expect about 24 trains through Essex during a 24-hour period. 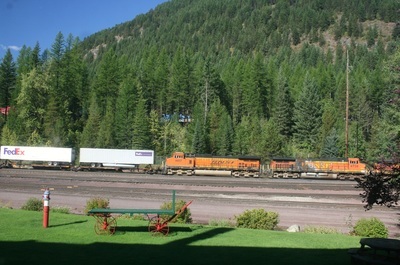 Commonly seen freights include double stack/intermodal, grain, oil and regular merchandise trains. Amtrak's Empire Builder passes twice daily (once each way). 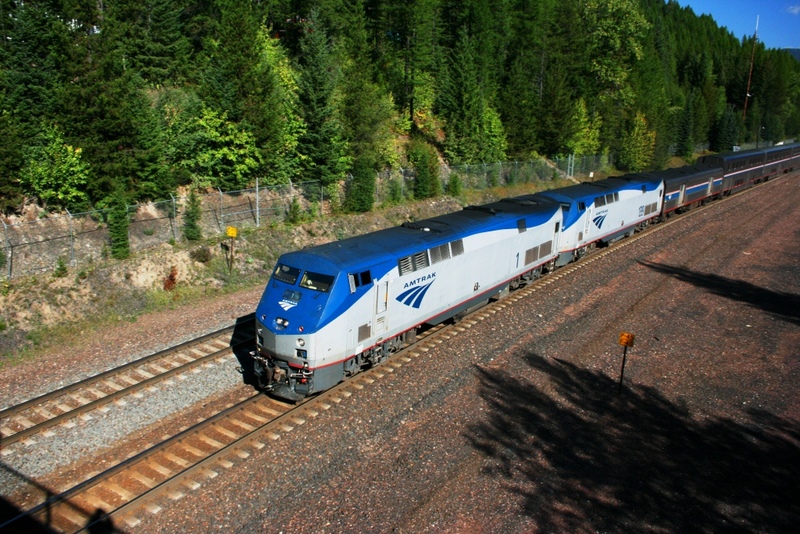 The westbound Amtrak # 7 is scheduled at 7:41pm, the eastbound # 8 is scheduled at 8:55am. Essex is a flag stop on Amtrak, and only makes the station stop for reserved ticketed passengers. Site Details: The area surrounding the Izaak Walton Inn is very peaceful, quiet and gives you the feeling of the back woods country. The foot bridge that crosses the BNSF Railway is a great central point for photography and video recording, but the entire area is very photogenic. There are not fences along the railroad which allows photography from ground level very rewarding. Walking down the quiet road to the Amtrak station allows for other photo opportunities as trains swing around the curve. Although I recommend staying at the Izaak Walton Inn, the area is not off limits to non-guests. Train-watching as well as the foot bridge is open to the public. 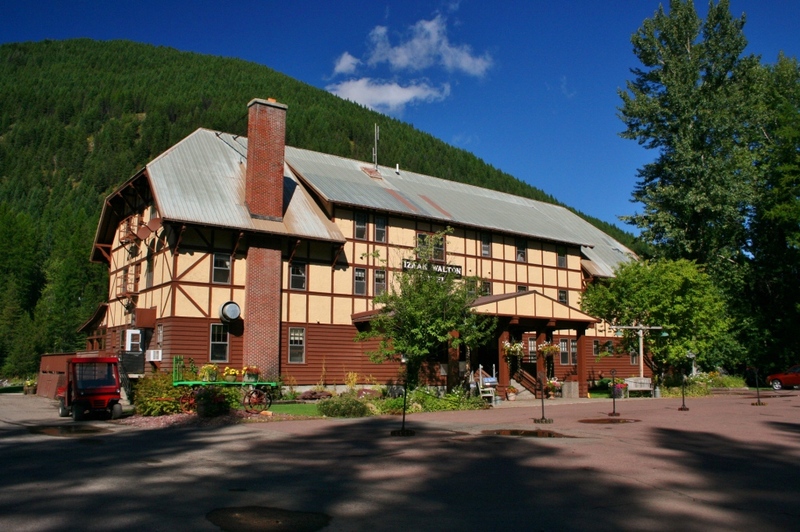 The Izaak Walton Inn has a common room to rest, gift shop, and restaurant as well as a bar/lounge. 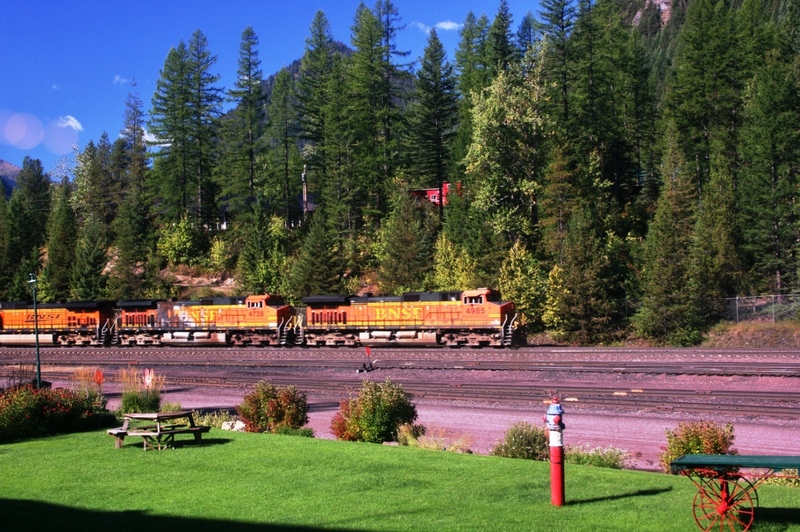 Even if you’re not spending a night, the Izaak Walton has a lot to offer for travelers and visitors passing through. 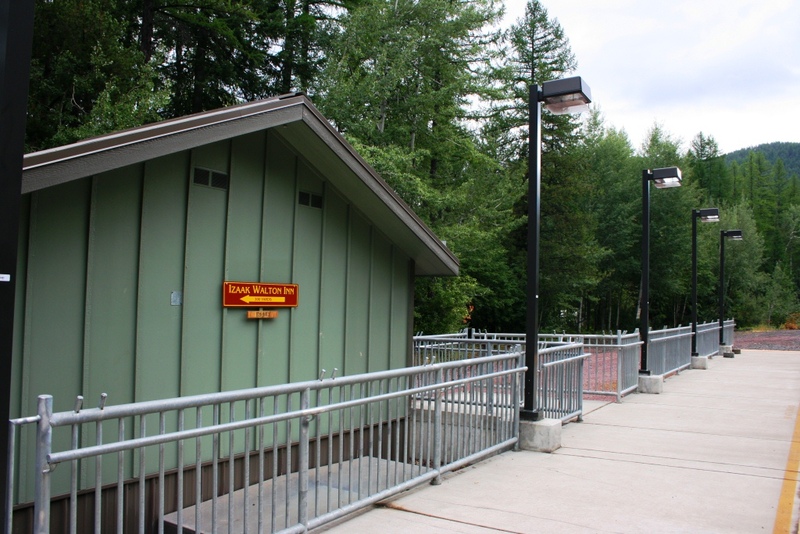 Restrooms on site: Yes, inside the Izaak Walton Inn. 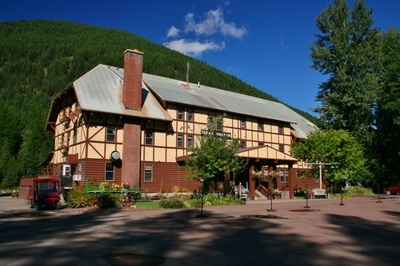 Food: Izaak Walton Inn has a nice restaurant, prices are a bit high in my opinion, but there is no other nearby options. Their gift shop may also offer light snacks and beverages. There is also a bar/lounge located in the basement of the Izaak Walton. 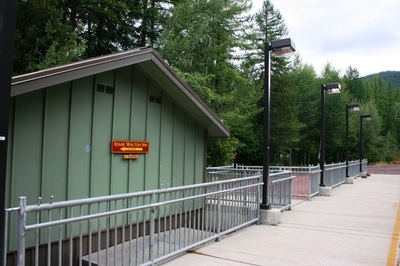 Picnic Area: Yes, outside the Izaak Walton Inn. Parking: Free parking around the Izaak Walton Inn. I do not believe there are restrictions parking down near the Amtrak platform as well. Lighted for eveing railfanning: Yes. Motels / Hotels: Izaak Walton Inn - The only show in town, the only lodging choice in the area (for about 30-miles). 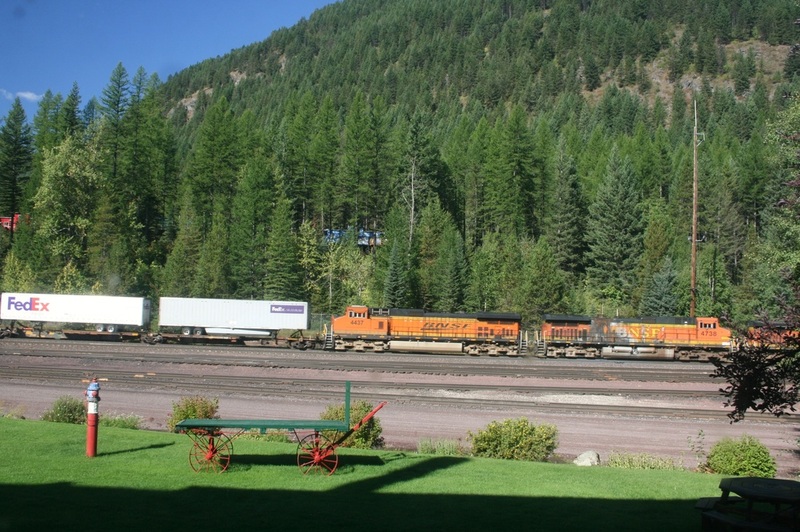 Highly recommended, and is an excellent "railfan motel"! Just request a room on the railroad side of the Inn. 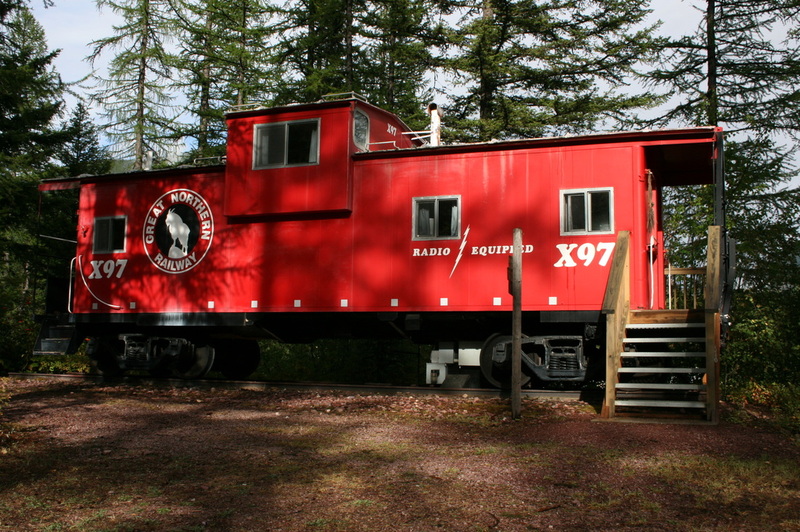 Besides the actual Inn, the folks at Izaak Walton offer upgraded lodging in forms of several cabooses and small personal cabins. They also off a premium stay inside former Great Northern F45 locomotive # 441, which was converted into a luxury cabin, while keeping the outside appearance almost intact. 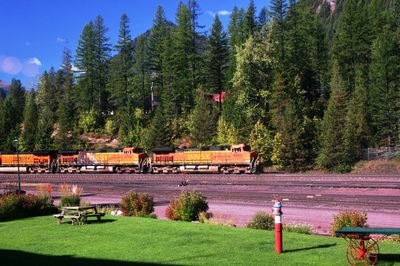 For guests looking to have a railroad view from their room, keep in mind, the cabins do not have a railroad view, and the cabooses only offer a limited view of passing trains. The view from GN 441 and the Inn itself is excellent. Rail Travelogue by Carl Morrison, Carl@Trainweb.com, with help from Don "Preacher" Roe.